We have a large variety of leather ring belts that are sure to be a great addition to your Medieval Garb. 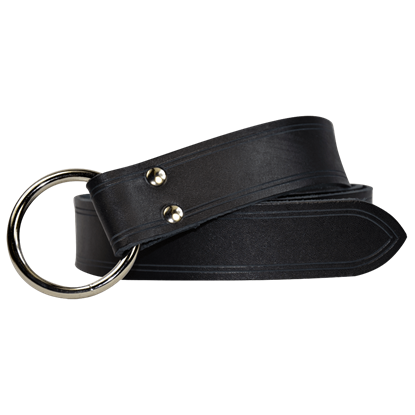 Our leather ring belts come in a variety of styles, sizes and colors. We have styles such as peasants ring belt, crusader ring belt and studded ring belts just to name a few. Leather ring belts give you that medieval look for a re-enactment or medieval faire. All our ring belts are handcraft and made with quality leather. The artistry of the Celts is timeless. 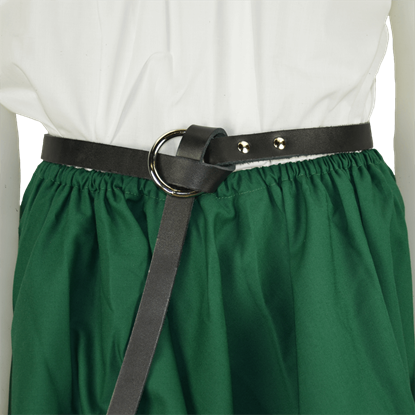 Add beauty inspired by their designs to any outfit with the Celtic Embossed Buckle Belt. 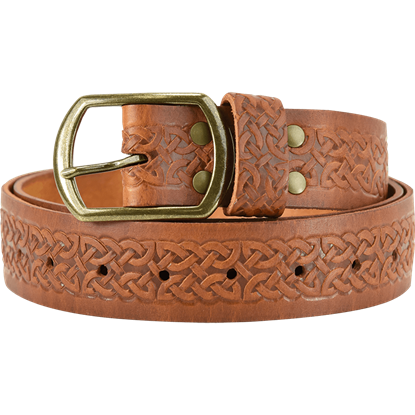 This handmade leather belt has its entire length and its belt keeper embossed with Celtic knotwork. Our Childs Medieval Ring Belt is made of 7/8 oz. 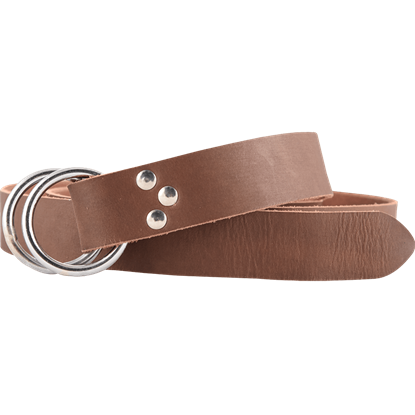 sturdy belt leather and a great accent for your little one. It is 1.5 inches wide and 50 inches long. It is available in black, brown, red, green, blue and natural, undyed leather. 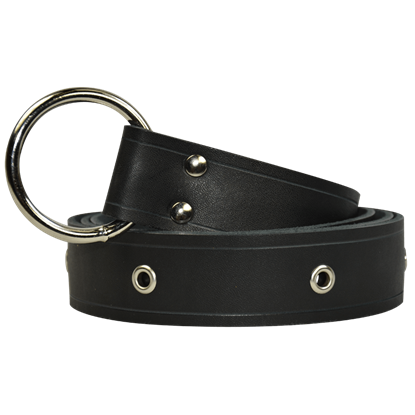 Our Childs Thin Medieval Ring Belt is made of quality leather. It is 0.75 inches wide and comes in 4 different lengths. It is available in several different colors, and you also have a choice of silver (steel) or gold (brass) hardware. Our Crusaders Cross Studded Medieval Ring Belt is perfect for any medieval or renaissance outfit. This belt is studded and made of 7/8 oz. sturdy belt leather. It comes in two different lengths and a variety of colors. Medieval clothing tends toward loose-fitting, which means it can sometimes get in your way. That does not mean you should have to deal with that nonsense! 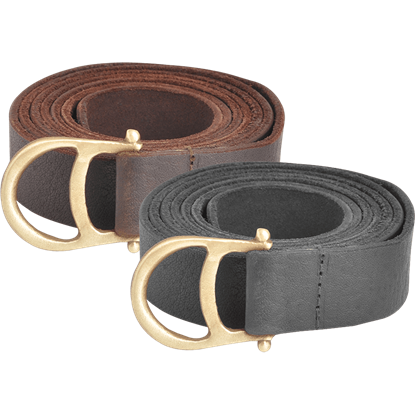 Luckily, the Diana Leather Ring Belt is here to help keep some of that fluff contained. You may have the tunic, the boots, and the pants, but without a medieval belt keeping your shirt cinched against your body, your outfit is not truly complete. 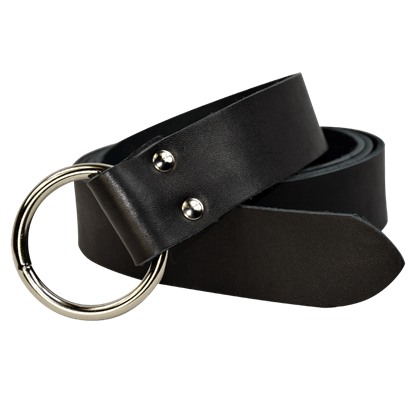 Add that essential element with the Black Double Ring Leather Belt. 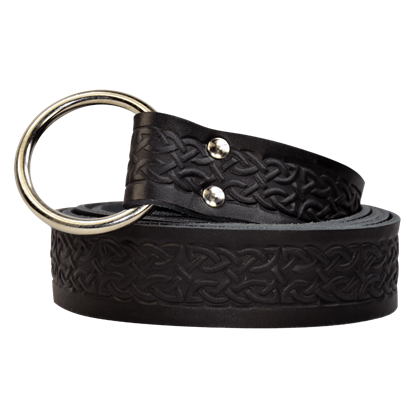 Our Celtic Ring Belt is a plain ring belt with embossed Celtic knotwork all the way down the belt. Made of 7/8 oz. sturdy belt leather. It is 1.5 inches wide and comes in two different lengths and a variety of colors. 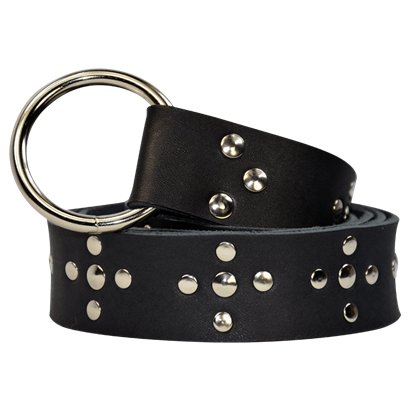 This leather Ring Belt features grommets down the full length of the belt. This brings detail to your outfit and also makes it convenient to tie any of your belongings to your belt. The belt goes well with a variety of styles. Our Knights Studded Medieval Ring Belt is perfect for any medieval or renaissance outfit. Made of 7/8 oz. leather, it is 1.5 inches wide and comes in two lengths and a variety of colors. It is a must for anyone going to the fair! You cannot beat the versatility of a black leather ring belt, and the Laced Leather Ring Belt in Black with Red brings an extra touch of style to the form. 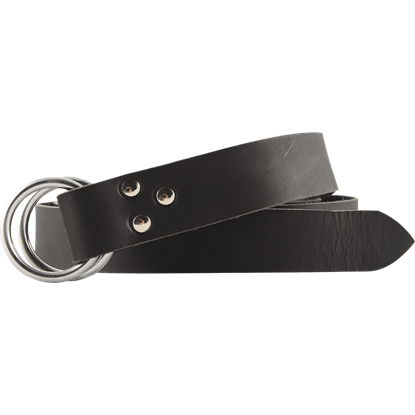 This black leather belt has red leather in an X pattern along its length.